Hendrika van Dyk started practising yoga at the age of eighteen in the Netherlands where she lived till the age of twenty-five. Two teachers stand out in the lifeline of her work: her first spiritual teacher, Masahiro Oki, the Japanese founder of Oki-do yoga, and Julie Henderson who was fundamental in bringing Somatics to Australia and later on developed Zapchen Somatics. This holistic way of teaching yoga became the template for forming Somatic yoga. In 1984 Hendrika came to Australia and joined Takao Nakazawa at the Oki-do yoga centre in Melbourne. She belonged to the first group of Oki-do yoga teachers there and was active as a staff member for several years. In 1988 she began studies at the College of Somatic Psychotherapy and holds a Certificate and Diploma in Somatic therapy, extended by two one-year trainings with the College in Healing, Facilitation and Energy and the Asclepian Choice. She also holds a Certificate in Five Element Therapy (Chinese healing philosophy) and a Diploma in Formulas for Change (Chinese Medicine) from the College for East West studies. From 1993 Hendrika organised retreats and training programs in Zapchen Somatics (a marriage between Somatic psychotherapy and Varjayana Buddhism) for Julie Henderson. She studied with Julie and her colleague Tony Richardson for many years and holds a Diploma in advanced Zapchen Somatics. Hendrika has expertise in Cranial/sacral therapy, Ortho-Bionomy and Shock and Trauma and has studied Pilates, Aikido and Authentic Movement, breath work and voice work. She completed a post-graduate course in Movement and Dance at Melbourne University (Laban Method, Bartenieff fundamentals, Authentic Movement, and Dance improvisation). 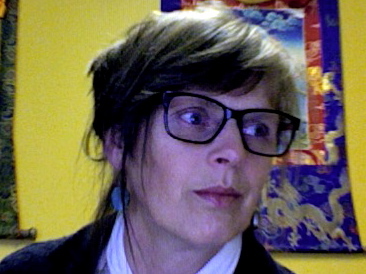 She also studies and practises Tibetan Buddhism, with a gravitational attraction to Dzogchen. She is grateful and respectful to all Dharma teaching and in particular to Drukchen Rinpoche and his father Bairo Tulku, in both of whom her heart rejoices. Hendrika founded and ran the Somatic Yoga Centre in Malvern from 1992 to 2019 where she offered Somatic therapy and taught Somatic yoga and meditation. She has been a teacher at the Australian Shiatsu College for the last 27 years. She has also taught movement at the Melba Conservatorium and meditation at Melbourne University. She now lives and works in the beautiful Yarra Valley.